Look what we found!! 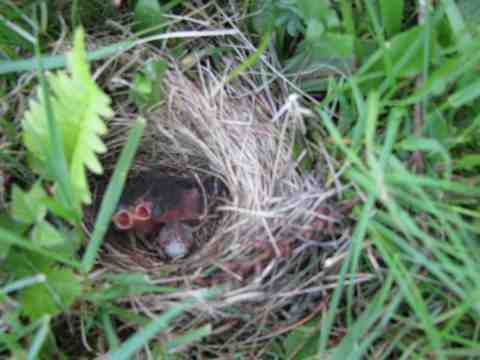 This very simple nest made from grass clippings and a few twigs belongs to these one day old Oregon Junco’s. We discovered this quite by mistake. The mother bird flew away when we got close which made us look down and discover this. WOW!! This entry was posted in 2008 and tagged birds. Bookmark the permalink. Marci–thank you for visiting my blog! We too have a little nest with newly hatched birds–we have been photographing it every day. It’s a wonderful progression!! The little birds are just furry lumps right now, but I am sure that every day will bring new surprises! How precious! I love discoveries like this. We found the same bird nest in my wheelbarrow planted with flowers! This is the second year she made a nest there. They seem to be loyal to the place they nest, so check there again next year. Ours just flew the coop this last weekend. Enjoy the beauty!